This image really stands out, Woody. It’s very powerful. Can you tell us a little to set the stage? Thanks Ross. And thanks for thinking about me for “The Image, Deconstructed.” It's an honor. 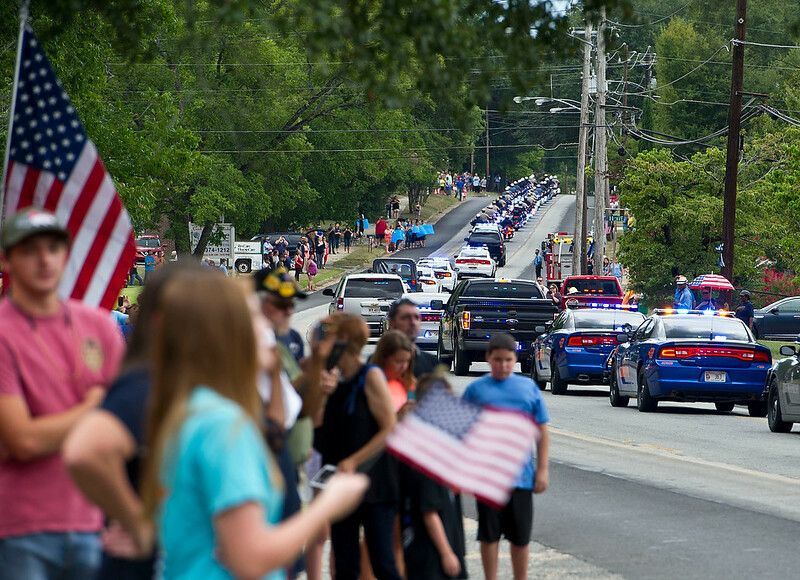 This was from the funeral of Eastman police officer Tim Smith. He was shot and killed while answering a late-night call about a suspicious man with a gun. Eastman is a small city about an hour southeast of Macon. The Telegraph sent a photographer down the day after Smith was shot and got reaction from the community. 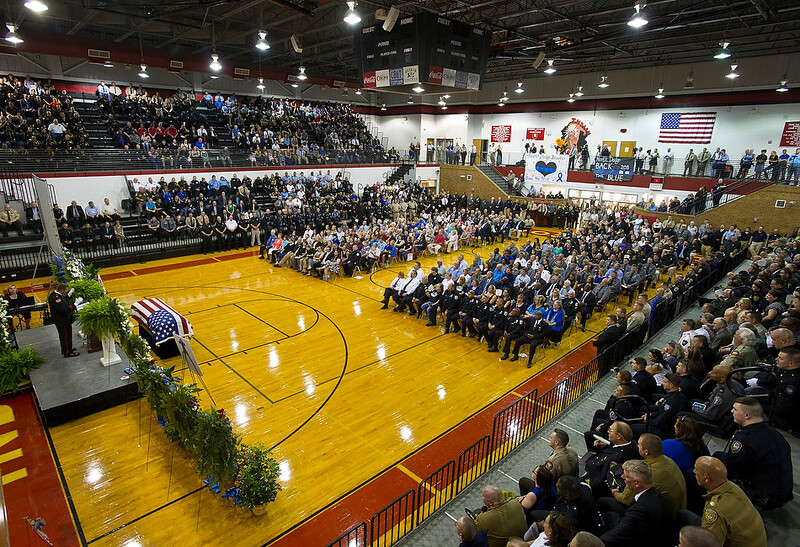 I went down for the funeral that was held in the Dodge County High School gymnasium a few days later. I was working the morning shift because one of the staff photographers was on vacation that day. What type of preparation did you do before the shoot? I had been following our coverage closely, so I would knew the story. I called the funeral home to see if the media were going to be welcomed and to find out if there was going to be anything special about the service. I dressed appropriately for a funeral service. I have covered a lot of funerals, so I knew what the paper needed. I also called the reporter on the way to the service to make sure we were on the same page. As far as preparing mentally and emotionally, I tried to arrive early so I wouldn’t feel rushed and anxious. Funerals are tough for me, because I get sad for people who have lost a loved one. You have worked in your community for many years. How does this help you broadly, as well as with this specific assignment? I started working at The Telegraph in January 1997. So I've been in the community a while. Knowing the history of the community helps you understand how it's changing and where it's going. But more than that, I care about the community. I have seen so much improvement in Macon and want to be part of continuing that improvement. I think the newspaper is a good place to help make that happen. But Eastman isn’t an area that the paper covers as much as we used to. I did know some of the sheriffs, deputies and police in the crowd. I was able to talk to some of them a little during family visitation. Can you talk about how you managed your body language in this assignment? 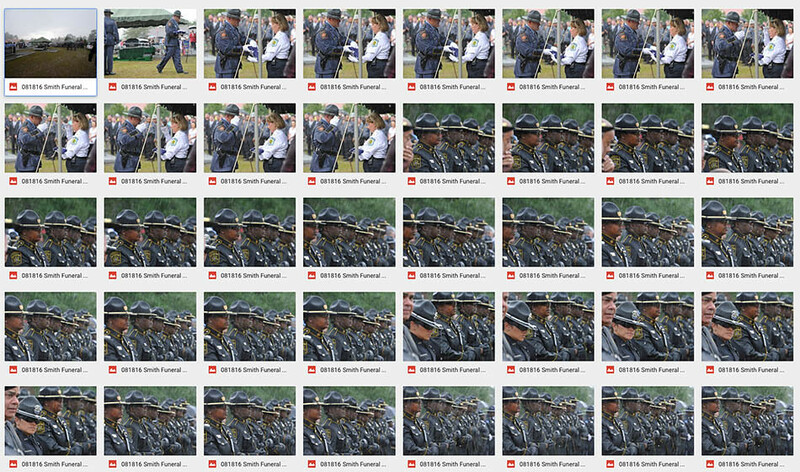 I think it’s something that’s often overlooked as a key aspect to effective photojournalism. I'm kinda round so It's difficult for me to just blend in. I ask people if it’s OK with them if I work in front of them for a few minutes. Most people don’t mind and seem to appreciate that I ask. I look around while I’m working to try and make sure I’m seeing everything I can. Dressing appropriately for an assignment like this is important. I was disappointed in a local TV personality who was wearing shorts and a polo shirt at the funeral. I wear a lanyard with a couple of different ID cards just so it’s clear I work for the paper. I knew photographing the casket being moved out of the gym, with the bagpiper, would be a nice photo, but it would mean having a hard time getting in front of the casket as it was moved to the caisson outside. So during visitation, I found an exit I could use that would avoid the crowd leaving through the main exit. With a little planning, I was able to photograph the casket being moved out of the gym and get to the caisson without running in front of people. The rain was a problem that I was unprepared for. I could see the quality of the image in the viewfinder deteriorating the longer I was out in the rain, and water gathered on the front of the lens. I have rain gear for the camera and lenses in the car. But if I had taken the time to cover the camera, the graveside service would have been over by the time I would have gotten to it. I decided pretty quickly that being there was better than being dry. My equipment didn’t fail and I dried it out the best I could while I was filing photos. The rainstorm mostly. I could see the weather changing but I just wasn’t ready for it when it came. What has really surprised me is how many people emailed me about the photo. People I don’t know are telling me how much they appreciate it. A lot of sheriffs from all parts of Georgia have emailed expressing how much they appreciate it. I was overwhelmed by the response it got on Facebook. I post photos I’m happy with whenever I have one. But no other photo I’ve posted has gotten this kind of response. Now, onto the main image. Can you walk us through the moments leading up to it? Additionally, can you talk about what you were thinking/processing while making the image? There was family visitation from 11 a.m. to 1:45 p.m. I got there a little before and made some video of the procession going to the gymnasium. 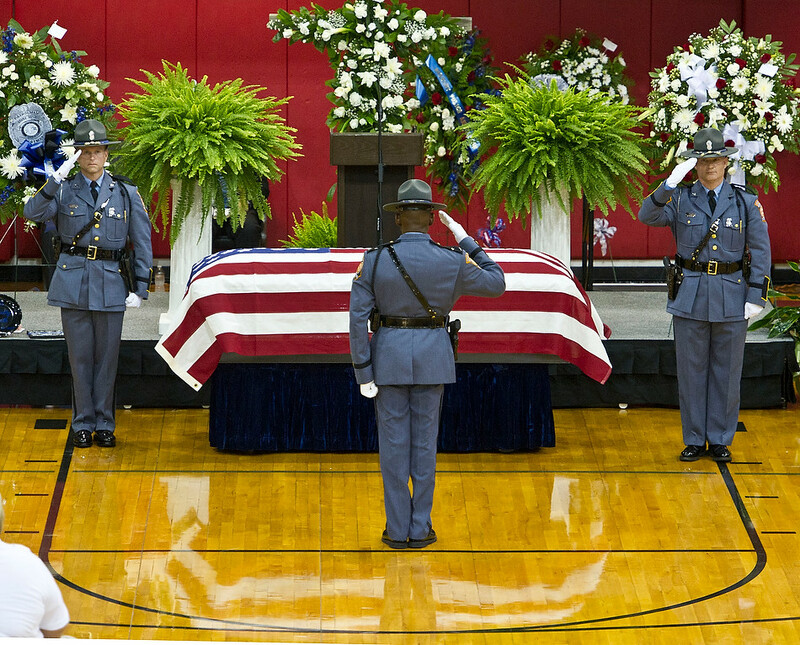 As I walked in the gymnasium, one of the funeral directors stopped me to let me know that the family had asked that there be no photos of the open casket and no photos of family grieving. 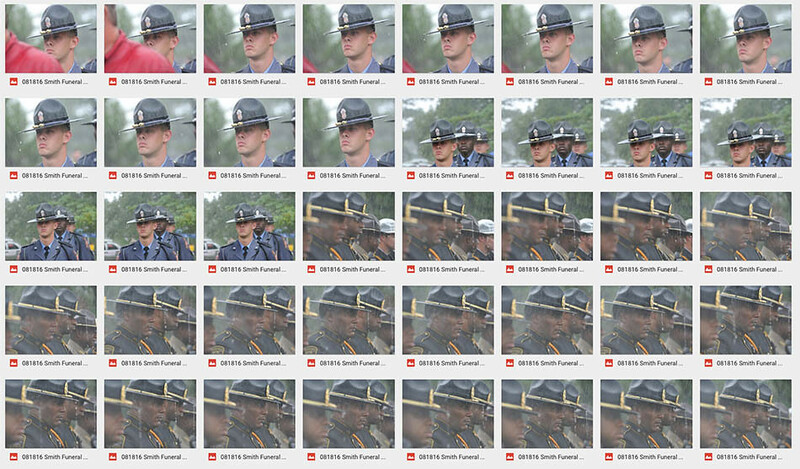 I made a few images that I filed to the paper and the AP before the funeral. 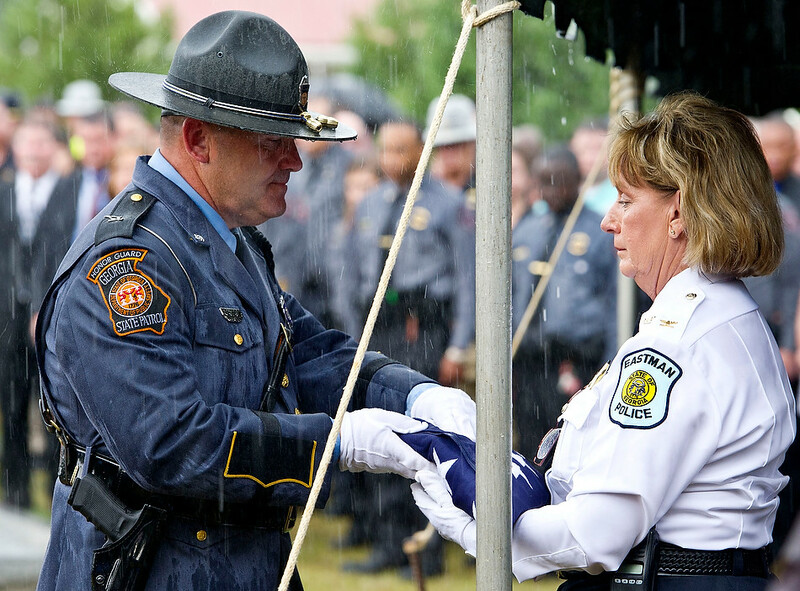 The funeral was well-attended by the community and law enforcement officers from around Georgia. It's was hot in gym. The funeral was over a little after 3 p.m. An honor guard moved the casket to a horse-drawn caisson. It was starting to cloud up and it looked like bad weather was on the way. I got a few images of the caisson and moved to a position in town to cover the long line of Patriot Guard Riders, Veterans of Foreign Wars Riders and police vehicles in the procession. The procession was very long with more than 300 vehicles in the line. After it went by I followed it to the cemetery for the graveside service. As we got closer to the cemetery, the wind was picking up. By the time I got to the cemetery, police cars lined both sides of the road for a quarter-mile or more in each direction, and it was just starting to rain. I found a spot someone had abandoned close to the cemetery and the bottom fell out. I got my rain coat and cameras and rushed across the road, over a ditch and into the cemetery. As I got to the graveside service, the flag ceremony was just ending. I had to feel out what was going on quickly and what I could photograph without the family in the images. I was really out of position for the flag handoff and got a tent pole and guy-rope right in the middle of the frame. Then I noticed that most of the honor guard members didn't have rain covers on their campaign hats and that rain was dripping off the brims. So I started working that and was just trying different lines of officers until I found one I thought would work. There was one female honor guard member that was giving me the stink eye, so I quickly moved off of her. The rain was coming down pretty hard and the front lens element on both cameras was getting wet. When I found a line of hats that I liked, I started working it pretty hard. I shot a few with more depth of field and a slow shutter speed, and then moved the ISO higher and made a few where the drips were frozen. I shot one more overall and the service was over. I knew the faces would be stern. I had photographed honor guards before. 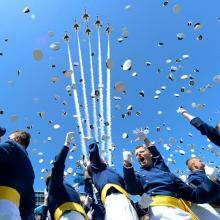 But I thought if I could get water coming off the front of the hats it might be special. That was one thing I had never seen while working a funeral before. What did you learn about yourself during this event? Ross, I’m closer to being an old man than a young man and I know myself pretty well by now. But one thing I have learned over the years is that sometimes you get access and sometimes you don’t. At a thing like this you have to respect the family’s wishes and do the best you can with what you have. 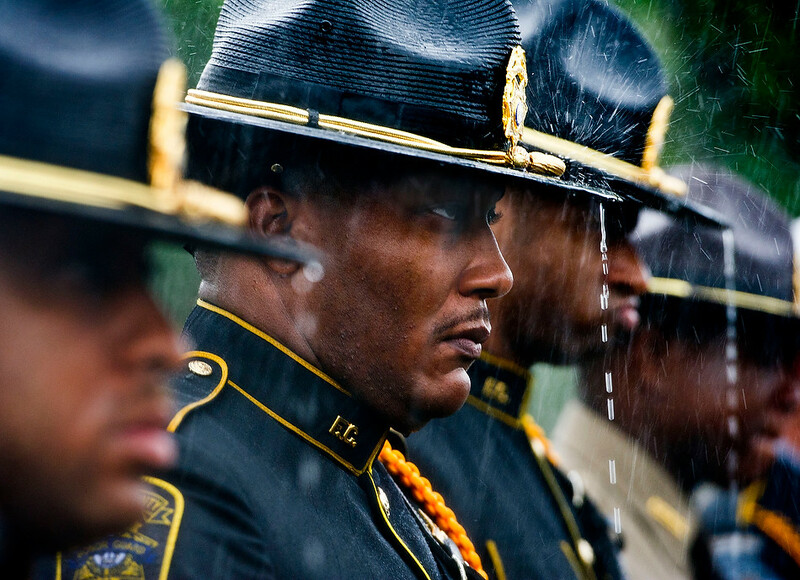 If the family had been OK with having their photo made, I might have never noticed the rain dripping off the officers’ hats. There was a time when hearing no photos of the family would have been a major distraction for me. Everyone has something they can teach you. In conclusion, do you have any additional advice for photographers in this situation? Like I said before. Do the best with what you have. 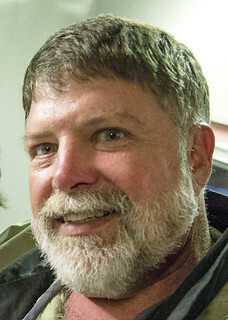 Woody Marshall started working as a news photographer in the seventh grade Sumner Elementary School newspaper in Greensboro, N.C. After graduating in 1984 with an associate degree in photography from Randolph Community College, he promptly became a forklift mechanic. Soon he secured a part-time photographer position at The High Point Enterprise. In six years he went from part time to full time to part time to full time to laid off. He worked a few months in Opelika, Ala., at the Opelika-Auburn News and then moved back to North Carolina to be the photo chief at The Times-News in Burlington. In 1997 he became the photo leader at The Macon Telegraph, now The Telegraph. He loves the community where he works and lives with his wife Barbara and their dog Booger.